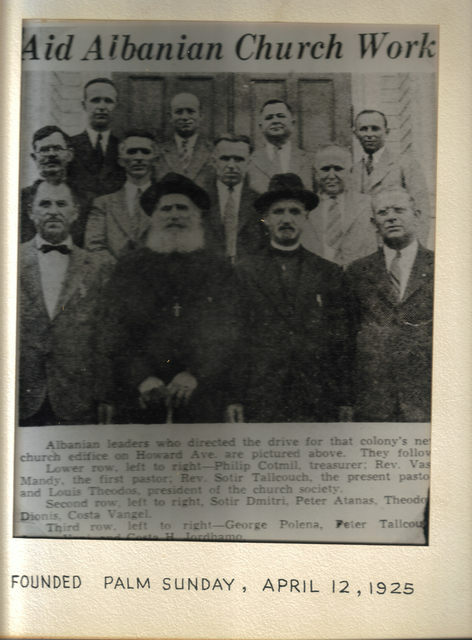 From a local newspaper photo: Photo of the leaders who directed the drive that built the first St. George Church on Howard Avenue in Bridgeport. 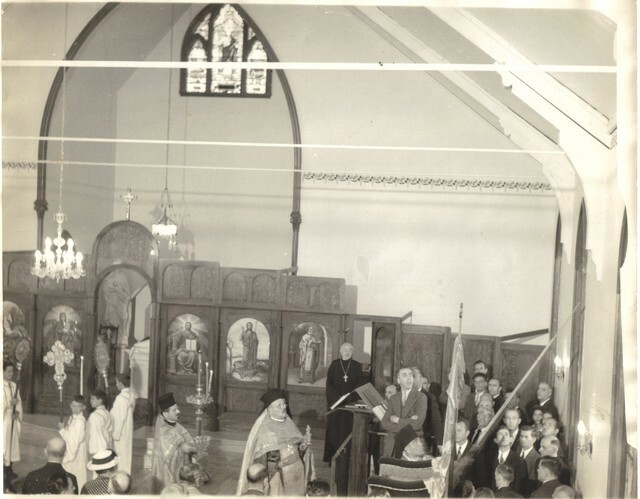 The first Orthodox church services were held in Bridgeport on Palm Sunday, April 12, 1925. At that time and up to the dedication of the church on Howard Avenue, worship was conducted in various community halls and buildings. Lower row, left to right: Philip Cotmil, Rev. Vasil Mandy, Rev. Sotir Tallcouch, Louis Theodos. Second row, left to right: Sotir Dmitri, Peter Atanas, Theodore Dionis, Cossta Vangel. Third Row, left to right: George Polena, Peter Tallcouch, Unidentified, Costa H. Jordhamo. Fr. 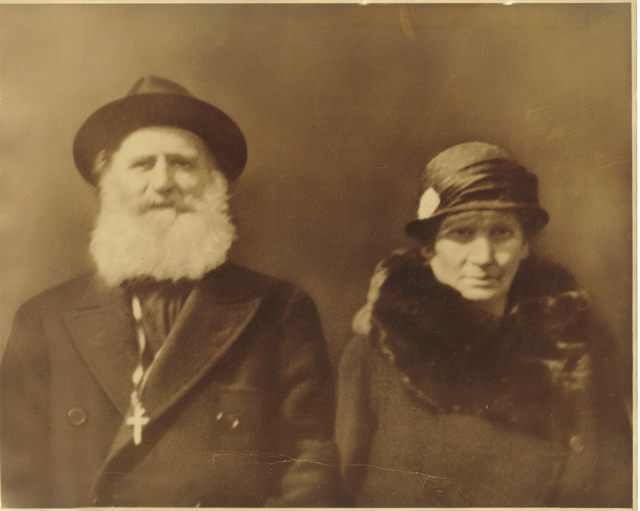 Vasil and Prifteresa Efrosinia Mandy. Fr. 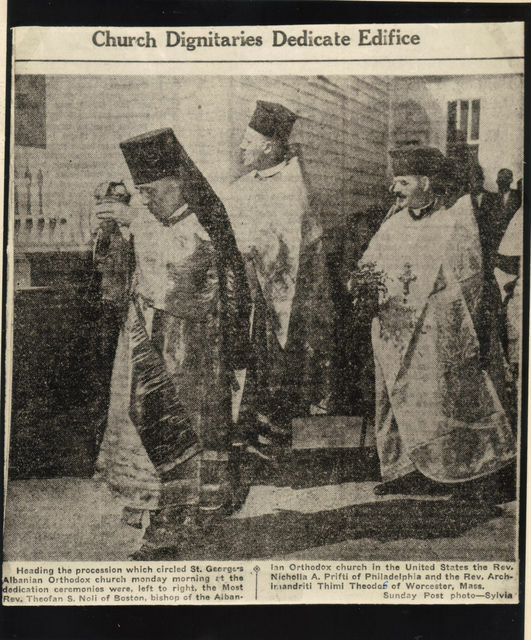 Vasil was the first priest of our community in Bridgeport. Date unknown. From a local newspaper (Sunday Post) photo. Dedication ceremonies at St. George Albanian Orthodox Church on Howard Avenue in Bridgeport. Most Rev. 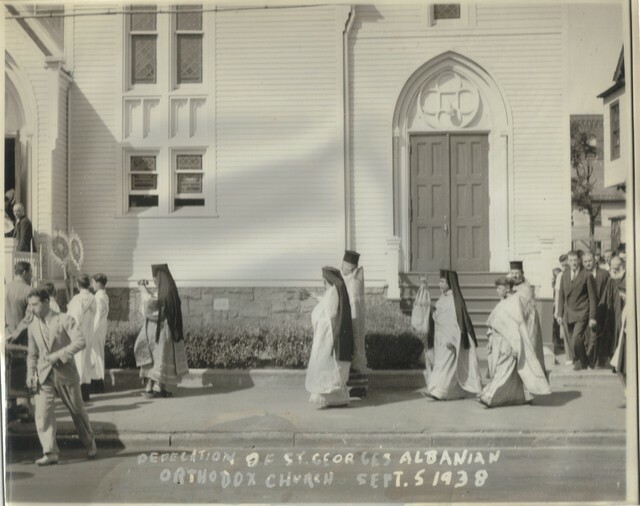 Theofan S. Noli of Boston, Bishop of the Albanian Orthodox Church in America, Rev. Nicholia A. Prifti of Philidelphia, PA, and Rev. Archimandriti Thimi Theodor of Worcester, MA. Date: September 5, 1938. 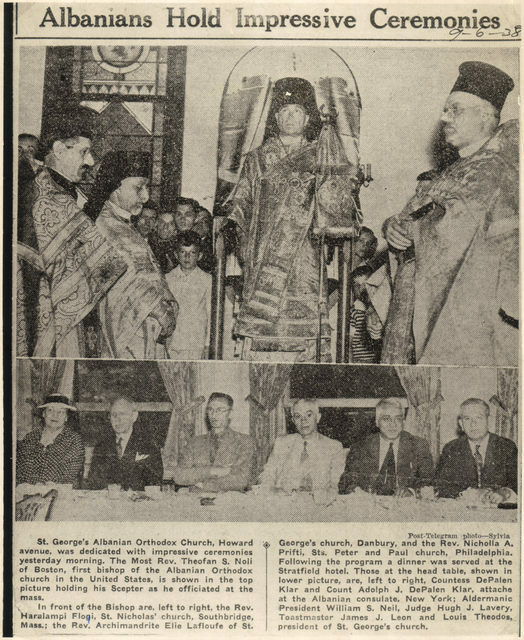 Another photo from local newspaper (Post-Telegram 9-6-1938) reporting on the dedication of the Howard Avenue church which occurred on September 5, 1938.